Living in this country, it's easy to think we're the place where democracy happens, where people exercise their rights of expression on a regular basis. But it happens in other places, too, in places that don't spring to mind when the subject of democracy comes up. In Oaxaca, Mexico, for instance. In 2006, teachers started protesting against government education reforms and were soon joined by housewives, indigenous communities, health workers, farmers and students in a nonviolent movement. 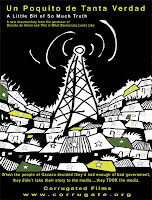 They took over 14 radio stations and a TV station and used those media to organize and mobilize their efforts for social, cultural, and economic justice. Jill Freidberg has made an award-winning documentary about this event, Un Poquito de Tanta Verdad (A Little Bit of So Much Truth), and she'll be here to screen and answer questions about it at the Hollywood Theatre on April 11. Whether you're aware of the issues or not, being able to see a film and talk with the person who made it is always fascinating because of their passion for their subject. It will be well worth your effort. Details: Un Poquito de Tanta Verdad (A Little Bit of So Much Truth). Apr. 11, 7 pm; $6.50. Hollywood Theatre, 4122 NE Sandy Blvd. 503-493-1128.